This activity is a unique meeting bringing together clinicians and scientists to explore the complex relationships between the heart and kidney. The interplay between the kidneys and the cardiovascular system is complex. The close relationship of renal function and cardiac function has given rise to the concept of cardio-renal syndromes. This interplay extends beyond these syndromes and manifests itself in the form of hypertension, metabolic syndrome, and peripheral vascular disease. With the epidemic of obesity, diabetes, and aging of the United States population, physicians will continue to face a growing number of patients with renal and cardiovascular disease. This interprofessional CE program will serve to help foster education and discussion about the intersection of these two pathophysiologic systems. This activity is designed to meet the educational needs of physicians and other healthcare professionals who specialize in cardiology and nephrology. Do we need to protect the kidneys in dialysis patients? Rising creatinine in heart failure management- is it always bad? Dr. Prasad graduated from Louisiana State University School of Medicine in New Orleans in 2000. He completed Internal Medicine and Cardiology training at the University of Texas Southwestern at Dallas. Subsequently, he completed an Interventional Cardiology and an Endovascular Fellowship at the University of California San Diego. He then joined the faculty at UC San Diego and after three years moved back to Texas to join the faculty at UT Health Science Center at San Antonio as an Assistant Clinical Professor. He is currently an Associate Professor of Medicine and holds the Freeman Heart Association Endowment in Cardiovascular Disease. He also is the Director of the Cardiac Catheterization Laboratory at University Health System. His clinical interests are centered on the endovascular treatment of peripheral arterial disease including carotid and lower extremity disease, transcatheter aortic valve replacement, percutaneous ventricular support devices and complex high risk percutaneous coronary interventions. Dr. Prasad has a focus on Vascular Medicine, is also board certified by the American Board of Vascular Medicine, and holds a certification as a Registered Physician in Vascular Interpretation (RPVI). He conducts a monthly Vascular Medicine Clinic and is constructing a vascular imaging and venous ablation program at UT Health. 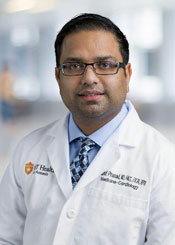 He has served as the Associate Program Director and Program Director for the Cardiovascular Diseases Fellowship Program at UT Health San Antonio. In addition to an active role in Fellow training, Dr. Prasad is involved with clinical research. He is the PI on both investigator initiated and industry sponsored clinical trials. His areas of current interest include novel approaches to therapy for limb salvage and acute kidney injury following endovascular interventions. He is also involved with efforts to understand subclinical vascular disease in minority populations and serves as a co-investigator in the Cameron County Hispanic Cohort Study. The goals of this endeavor are to understand the prevalence, predictors, and outcomes related to subclinical peripheral arterial disease in Mexican Americans. His research career has led to over 90 publications in peer reviewed journals. He is an Associate Editor of Catheterization and Cardiovascular Interventions (CCI), Associate Peripheral Arterial Disease Section Editor for SCAI.org, on the ACC Interventional Section writing committee, ACC NCDR PVI Steering committee, XLPAD steering committee and on the editorial board for the Journal of Invasive Cardiology and editorial consultant for the Journal of the American College of Cardiology. 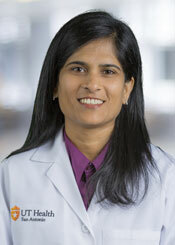 After obtaining medical degree from SMS Medical College, Jaipur and Residency in Internal Medicine from New Delhi, India, Dr. Bansal moved to the Unites States in 2001, where she went on to complete Internal Medicine Residency and Nephrology Fellowship from the University of Colorado, Denver. There she also obtained the certificate in Public Health Sciences. Dr. Bansal joined the Division of Nephrology at UT Health San Antonio in 2010 and currently is a clinical Associate Professor of Medicine. Dr. Bansal adores the pathophysiological role kidneys play in health and diseases, particularly the heart and liver failure, and is passionate about teaching this role to the medical students, residents, fellows and colleagues. She has been highly recognized for her outstanding teaching abilities and won several teaching awards. Lately, she has taken over as the Program Director of Nephrology Fellowship Program at UT Health San Antonio. Dr. Bansal’s research interest focuses on the volume/sodium control in the management of hypertension, kidney and cardiorenal patients. She has also been working on the inflammatory pathways in chronic kidney disease. She has received extra-mural and institutional grants to support her translational and clinical research projects. She is also funded for two new important Precision Medicine initiatives with NIH and consortial funding, and by several clinical industry grants. Lately, Dr. Bansal is getting involved with Health Service Research understanding why clinical research findings are not adopted into clinical practice specifically the hypertension management guidelines regarding diuretics in CKD, and understanding the barriers to implementation. She has over 30 peer reviewed publication and chapters. Dr. Bansal is an active supporter of the Institutional endeavors and has been chairing one of the Institutional Review Boards since 2015. She is an Associate Editor for Journal Clinical Nephrology. Dr. Bansal clinical interests align with her research interests and involve management of resistant hypertension, cardiorenal syndromes, diabetic nephropathy etc. Dr. Bansal established the peritoneal/home dialysis program at the partnered University Hospital System and fervently promotes this less-utilized modality to the patients and fellows. She also has served as a Medical Director of UHS outpatient renal clinics where she worked on improving patient care by reducing wait times, developing and implementing multiple policies, and streamlining the renal replacement therapy education and dialysis access placement. For the patient care, Dr. Bansal strongly believes that empowerment of patients by health education is the most important step to achieve the best outcomes. Fruition of Cardiorenal Connections meeting is partly the result of years of Dr. Bansal’s involvement understanding the interaction of kidneys with other organ systems, particularly the heart. This meeting is the perfect venue for providers from different disciplines to come together and discuss the challenges we face on routine basis which are not addressed in specialty specific conferences. As one of the founders, Dr. Bansal hopes that attendees enjoy this conference as much as she enjoys organizing it. ONLINE REGISTRATION WILL OPEN SOON. PLEASE CHECK BACK! If you must cancel, the registration fee will be refunded less a 25% handling charge (of the registration fee you selected) if notice is received by March 27, 2020. Cancellations received after March 27, 2020 will not be refunded. Healthcare professionals will receive a certificate of attendance and should consult with their licensing board for information on applicability and acceptance. Select presentations in this activity have been approved for medical ethics. University of Texas Health Science Center at San Antonio is accredited as a provider of continuing nursing education by the American Nurses Credentialing Center’s Commission on Accreditation. 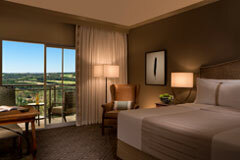 Situated atop one of the highest points in all of San Antonio, you'll find La Cantera Resort & Spa. It's a place where peace and tranquility flourish. Where emerald fairways and sparkling pools are the only things interrupting the scenic vistas overlooking the Texas Hill Country. 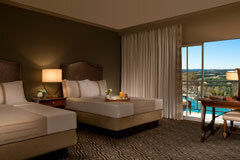 A place where you'll find a new sense of relaxation, whether you're staying for business or for a well-deserved vacation. 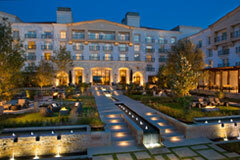 Welcome to La Cantera Resort & Spa. A block of rooms has been reserved and will be held until March 23, 2020 at the special rate. If rooms remain in the block after March 23, 2020, they will be returned to the hotel’s general inventory and the group rate may not be available. 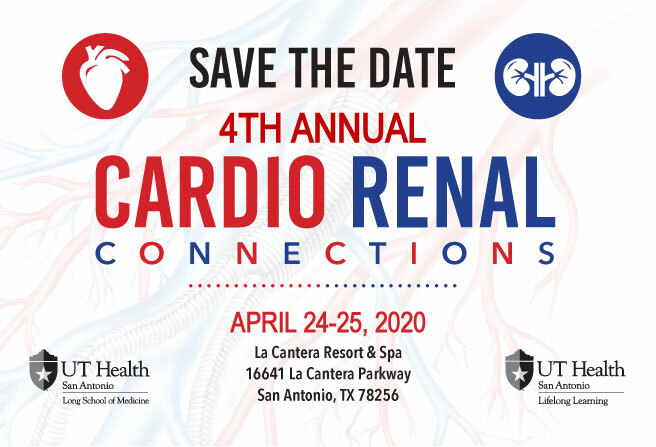 When making your reservation, please specify that you will be attending the “Cardio Renal Connections Conference” in order to qualify for the group rates. Reservations can be made by phone at (210) 558-6500.